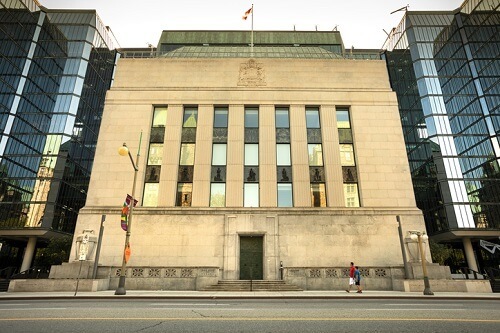 The Bank of Canada is expected to resist a rate hike today but has been warned to ignore the flattening yield curve at its peril. Governor Stephen Poloz is set to hold the bank’s benchmark interest rate at 1.5% as the economy grows in line with expectations despite inflation hitting 3%. Aubrey Basdeo, BlackRock’s head of fixed income, agrees with Poloz that the CPI number is “transitory” and expects the bank to continue with its plan to remove accommodation in a gradual fashion. He expects a maximum of one more hike this year. He added that NAFTA uncertainty, struggling emerging markets and doubts over whether the surging US market can drag everyone along with it, means investors should be adding resilience to their portfolio by, for example, using more short-duration bonds. Basdeo said that the yield curve is historically a signal, when inverted, that the economy is slowing aggressively and that a recession is imminent. Some have argued that this cycle is different because there are extraordinary factors at play. Basdeo does not buy this, despite believing Canada’s structural need for long duration assets meant the yield curve was exacerbated once the bank started to hike. He said: “The reaction we are seeing is more around the function of the economy likely slowing down as the bank increases interest rates, more so than the long duration demand factor. Basdeo added that while progress is being made with NAFTA talks, negotiation threats from the US remain. He said the bank will wait to see some hard data on the effect of any new deal before reacting. He said: “The immediate impact to Canada is that we should see a decline in exports and it’s going to be from the heartland, the manufacturing sector, so I think they just have to take a wait-and-see approach on that. It’s hard to gauge what’s going on at the moment. “The rhetoric coming out of it from one side suggests that either we agree to what they're asking for or there is no deal. If we agree to what they are asking for, it’s still going to have a negative impact on us because supply management means you’re going to disrupt the agricultural sector. “And if the intent is to have more manufacturing or orders being done in the US, again that’s going to have a negative impact or be a trade story.